Searching for a anti dust mite mattress cover with waterproof bedding protection too - this hi-tech solution brings comfort and security keeping your mattress fresh and looking like new! This is the ultimate anti-dust mite mattress cover. The fabric contains microcapsules of non-active probiotics – these are released when your body moves around on the mattress and absorb the dust mite droppings that cause allergies. Probiotics are the ‘friendly bacteria’ found in products like yoghurt; they have been shown in studies to be very effective at absorbing humidity and cleaning up dust mites. A clinical trial of the Lanaform Covertech found that it reduced dust mites by 89% over 14 days. Do you suffer with night sweats and menopausal hot flushes at night? This is the perfect way to a more comfortable nights sleep. Covertech’s fabric has a unique, three-dimensional honeycomb texture that allows for a high level of air circulation. This helps to regulate the temperature of your bed and keep you cool during the night. It also reduces the amount of moisture held in the mattress cover, evaporating sweat immediately to help you sleep and drastically reduce the amount of bacteria that can develop. 80% of people in Lanaform’s clinical trial said that the Covertech was more comfortable than their normal mattress cover. 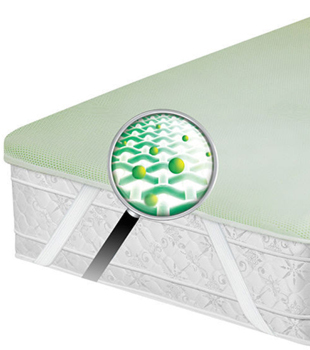 Protect Your Mattress Against Odour, Stains and Leaks. A waterproof membrane contained in Covertech’s fabric not only adds extra protection from sweat, it will protect your mattress from any liquid. This creates an unparalleled level of hygiene, particularly if you have a condition that causes incontinence. It will also help to combat accidental coffee or water spills from those weekend breakfasts in bed! The Covertech mattress protector is available in either single or double size and attaches to your mattress with elastic bands. It is machine washable in a normal 40 degree cycle and can be tumble dried. Waterproof matress cover protects from incontinence leaks, odour, dust mites, moisture and dirt. Breathable and comfortable mattress protector. 100% polyester liner with breathable polyurethane barrier to protect against wetness and odour.